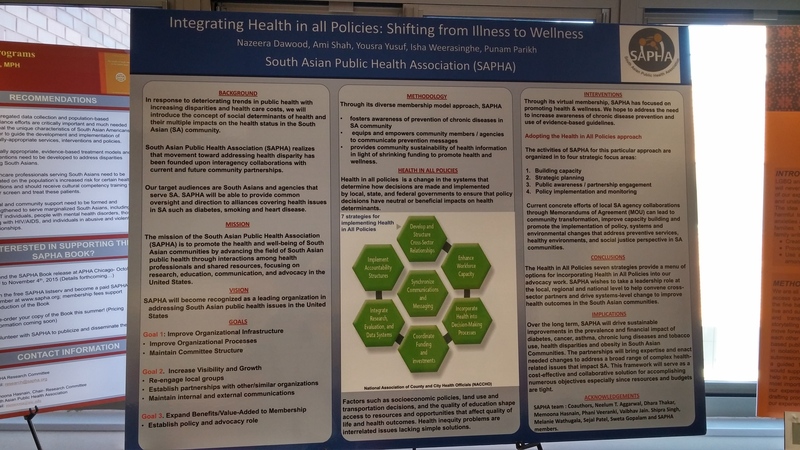 Thank you for placing your trust in me as President and in the other newly-elected Board members to lead South Asian Public Health Association (SAPHA) into the future. I would like to thank our immediate past president, Ami Shah, the Executive team Vaibhav Jain, Yousra Yusuf and Punam Parikh for their leadership, Board members Dhara Thakar, Phani Veeranki, Memoona Hasnain, Neelum Aggarwal, Shipra Singh and Isha Weerasinghe for their hard work, and our dedicated interns for their highly supportive roles. We welcome our new board members Simran Sabherwal, Shibani Ray-Mazumder, Sana Hashim and Monideepa Becerra for the 2016-18 term. There are many people who are hurting and there is a lot of work that needs to be done to connect the dots and get our community the help it needs. 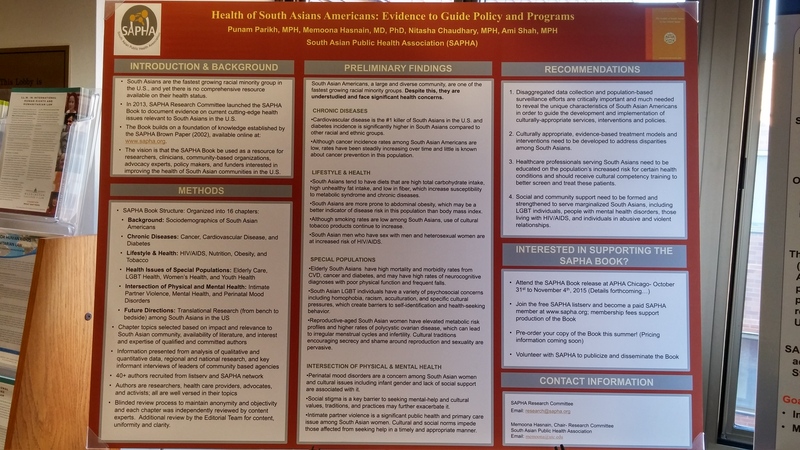 I am honored to be able to chair the South Asian Public Health Association for the next two years. I first joined SAPHA as a board member in 2013. In the three years that I have served as the Chair of Partnership committee, I have had the opportunity to play a supporting role in the growth of SAPHA. Moreover, the experience that I bring to SAPHA is diverse. Each experience has had its own value. From having practiced medicine in India, conducting clinical research at an academic setting, leading non-profits, practicing public health leadership at a local health department, taking charge of administration at the county Chairman’s Office, and ultimately, to have recently run for office, I have a wide array of skills and experiences that I am exciting to bring to SAPHA. I believe this experience will come into play as the 2016-18 board as I help transform SAPHA from being an operational board to being an aspirational, governing board. And I am excited to help SAPHA continue to advocate for the health and rights of the South Asian American communities today. I believe I speak for all the Board when I thank you for your commitment thus far. Also, we kindly ask you to continue to participate and share your ideas with us, and to invite all your colleagues to join us. Being a SAPHA member, you will have voting rights and eligibility to run for the SAPHA Board of Directors; eligibility to chair a SAPHA committee; access to exclusive member-only portions of the website; and advanced access to our book. And, as always, though we encourage you to become a SAPHA member, please remember you do not have to be a member to participate. Visit sapha.org/sapha-membership/ to learn more. Below are some highlights we would like to share with you. 1. SAPHA is pleased to receive a grant from the Centers for Disease Control and Prevention Foundation. We have executed a Memorandum of Understanding (MOU) with CDC Travelers’ Health Program, where SAPHA will serve as the premier organization to increase awareness among people about staying healthy and precautions to be taken while traveling to South Asian countries. 2. Our signature project, a book, titled “Health of South Asians in the US: An Evidence-based Guide for Policy and Program Development” will be launched during the course of this year. 3. As we move forward in 2016, the SAPHA Board will meet virtually every month to discuss our plan to a sustainable SAPHA. SAPHA board will transform from an operational Board to a governing Board. We thank Nova Sante Health Inc. for their free video conferencing services. And as always, we invite you to join us-become a member today! Working together, we can continue on our path to meet the goals of improving the health of South Asians and the communities within which they live. Thank you again and wishing you the best of the best for 2016.